Fun Casino invites all the players in the UK to take part in this great tournaments. Your aim is to obtain the best multiplier at the following slots Admiral Nelson, Book of Aztec, Billyonaire, Allways Joker, Lucky Little Devil, Flying Dutchman, Hot Choice, and Enchanted Cleopatra. If you succeed, the first place is rewarded with £2500. The prizes start at 25 bonus spins and are awarded for gamers on the 20th to 100th places. Wager your winnings 10 times before making any withdrawals. This promotion runs until 31st of May. Join the fun! 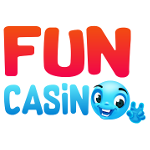 Access Fun Casino and begin your gaming journey right away! Register and you will receive 11 Spins without making any deposit. These extra rounds are valid on Starburst, Joker Pro, Wild Wild West or Finn, and the Swirly Spin. You can’t cash out more than £100 from this bonus. 1st deposit: 50% bonus up to £499 + 100 Spins on the games mentioned above. Use this money to have tons of fun! Wager your bonus amount 50 times before making any cash-outs. Keep in mind that deposits made with Skrill, Neteller or any similar programs are not valid for this offer. Contact support to benefit from this bonus. Claim it now and start playing the best games in the industry! Fun Casino invites all new players from the UK to get this bonus. Sign up and deposit at least 10 Pounds. For this money, you will receive 50% bonus up to £499 plus 100 Spins. The cash can be used on any games you want, while the extra rounds only on Starburst, Joker Pro, Wild Wild West or Finn and the Swirly spin. Wager your bonus 50 times before making cash-outs. Deposits made with Skrill, Neteller or any similar programs are not eligible for this bonus. Contact support to get this offer. Don’t let this promotion slip through your fingers! If you want to begin to gamble, but don’t want to start with a deposit, enter Fun Casino! Register and you’ll receive 11 no deposit spins. Contact support to claim this bonus. These extra rounds are valid on the best British games: Starburst, Joker Pro, Wild Wild West or Finn and the Swirly spin. Spin the reels and have tons of fun! You can’t cash out more than 100 Pounds from this bonus. Fun Casino decide to stand up to its name and give all its new players a magnificent exclusive no deposit bonus! Sign up to Fun Casino from the Kingcasinobonus app and get 51 no deposit spins to enjoy on three of your favourite classic slot games: Starburst, Aloha or Joker Pro. Your exclusive bonus will be activated only if you register through the link provided here and they will be allocated straight to your account upon registration. To withdraw your winning you need to wager 50 times and your maximum withdrawal from the no deposit spins is limited to 100 GBP. The bonus applies to all new players from UK and the other jurisdictions accepted by Fun Casino. Create your account now and enjoy your no deposit spins at this new delightful casino! Get the bonus and start the fun! Wager your bonus amount 50 times before any cash-outs. Your withdrawal limit is set at £100. Benefit from this offer and enjoy your experience!